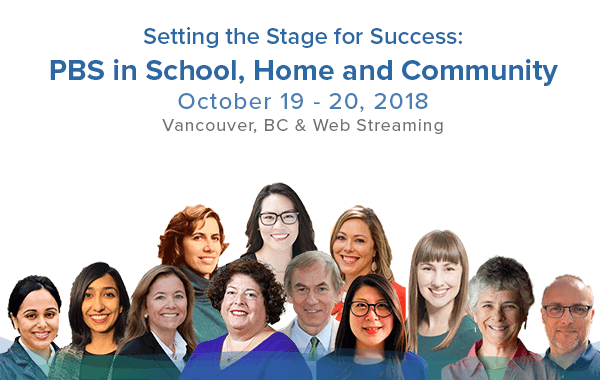 This two-day conference focuses on pro-actively engaging with educators, families, and communities to “set the stage for success” by using Positive Behavior Support techniques for students with ASD and other special needs. The focus is on providing practical information, informed by research, addressing: challenging behaviors; providing Tier 1 & 2 PBS to students with autism; involving peers to facilitate social engagement; providing culturally sensitive PBS. Special group rates of $75/ea for 3 or more people watching via web-streaming on the same screen – a great team-building opportunity for schools and clinics to train staff. Contact us to learn more. BACB-CEU’s will be available for in-person attendees, provided by CIRCA, details available shortly. Bursaries for low-income registrants are available. This entry was posted on October 19, 2018 by Stephanie Porter.